I fondly remember that during my high school days, my mother told me to keep a diary/journal and to write entries every day. Then she would give me money for my efforts. She did this so that I would be motivated to write. It was fun for I often had this entry: “My day was happy and that’s all.” Mother never complained. She just read my diary and gave me money at the end of the month. Then I graduated from high school and went to college. I stopped writing my journal because I was busy with my studies. But now I’m determined to accomplish the items in my Bucketlist and the first item is Start a Blog. So I am now starting to scribble my thoughts and put them in my Blog. There are experiences that I would love to share. 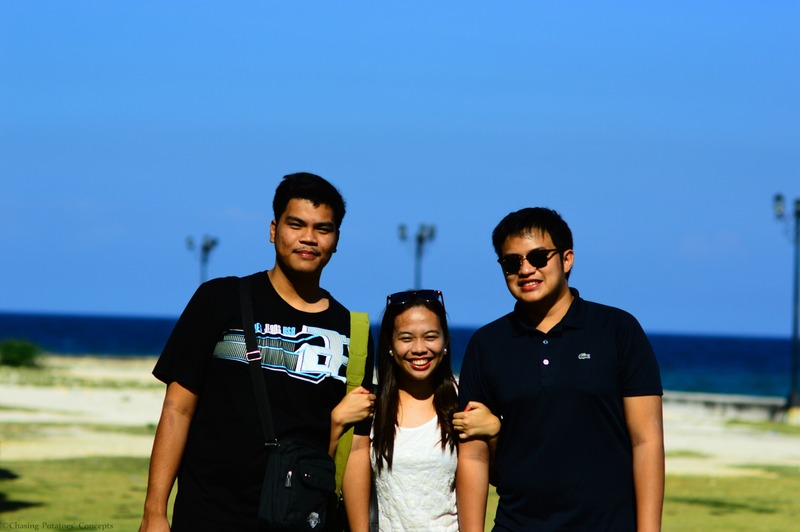 So here’s my 2nd travel entry: My Visit to OSLOB. When I got the chance to visit Oslob, I knew right then that there would be a lot of happiness and fun-filled adventure; happy tripping with friends, swimming with Whalesharks, admiring Tumalog Falls, taking a dip in Mainit Spring and strolling around Oslob Heritage Park. I am scared of a lot of things but I try my best to overcome my fears. It has been said that those who are afraid to cross the vast ocean cannot discover new lands. That’s why I gather enough courage because experiences are priceless. 🙂 I got a hundred of buckets full of lists of adventures to be experienced. So I must be brave enough to pursue the planned adventures in my Bucketlists. Our first adventure was the Whaleshark Watching. My first time to see whale sharks was a scary experience. I really got scared because they were huge. It seemed that one whale shark can devour a human being in just one bite. But naaah the longer I looked at the very huge creatures the more I realized that they were harmless. But oops even though they’re harmless, touching them is a BIG NO! Our next destination was the Mainit Spring. Before arriving at the place, I was excited for I can take a dip in a hot spring; but when I got there, I was disappointed because the water was not that hot. It was simply warm like ordinary tap water. Entrance fee was 20 pesos. Our next stop was the Tumalog Falls. On our way to Tumalog Falls, we have to go through a very steep and long way. But the good thing was that the road was cemented. The sweat on my face and the pain in my feet seemed to vanish when I reached Tumalog Falls. It was well worth the effort. God really knows how to beautify His creations. The falls was really amazing! Magnificent! Timer set in 1 2 3…. TADA!!! Awesome Foursome! LOL! Our final destination was the Oslob Heritage Park. If you love history, you will love this place because it’s really a revelation of the past. Interesting!!! The Church of the Nuestra Senora de la Inmaculada Concepcion in Oslob. The Cuartel (Spanish military barracks) -The Cuartel was erected by the Spaniards in 1898, and was left unfinished due to the arrival of the Americans. Truly having an adventure is fun but if shared with friends it becomes awesome and great. Friends are life’s best treasures. They are priceless treasures to keep. Love this! Our whale shark experience was so much fun. Your pics are amazing what camera do you use?